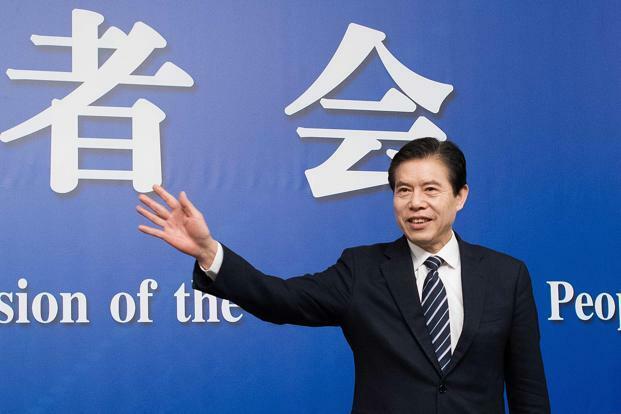 Beijing: China’s trade minister Zhong Shan warned that a trade war with the US would bring disaster to the global economy, but said his nation won’t start one and that talks with the Trump administration continue. Zhong added that the US trade deficit with China is overestimated by about 20%, citing research by a panel tasked with investigating the discrepancy between the two nations’ accounts of their trade balance. The deficit could be reduced by 35% if the US eased export controls on high-technology products to China, he said, citing unspecified US research. Trade tensions between the world’s two biggest economies intensified last week as President Donald Trump signed orders for stiff tariffs on steel and aluminum and indicated more actions are potentially on the way. The US administration asked China for a plan to cut the annual US trade deficit with the nation by $100 billion, a White House official said Friday. As China’s exports surged in February its monthly surplus with the US widened from a year earlier to $20.96 billion, according to data from the customs bureau. The US trade shortfall in goods with China surged 8.1% during the first year of Trump’s presidency, reaching a record $375 billion, according to Commerce Department data released last month. The main channel of dialogue on trade between the two nations, the Comprehensive Economic Dialogue, has been put on hold over US frustration over a lack of progress. But Zhong said communications have not been completely broken off.